Alas, it did not sell enough, and as the next chart showed, some of the SNB's top holdings would be the stocks that ended up getting hammered the most in the fourth quarter. Why "alas"? Because the central bank which is one of the biggest investors in US stocks (in order to depress the value of the Swiss Franc) reported today that it had ran upa loss of 15 billion francs ($15.3 billion) in 2018 as a result of the global stock market rout hitting its equity holdings, resulting in the biggest annual loss since the 2015 franc revaluation and the third biggest loss on record. 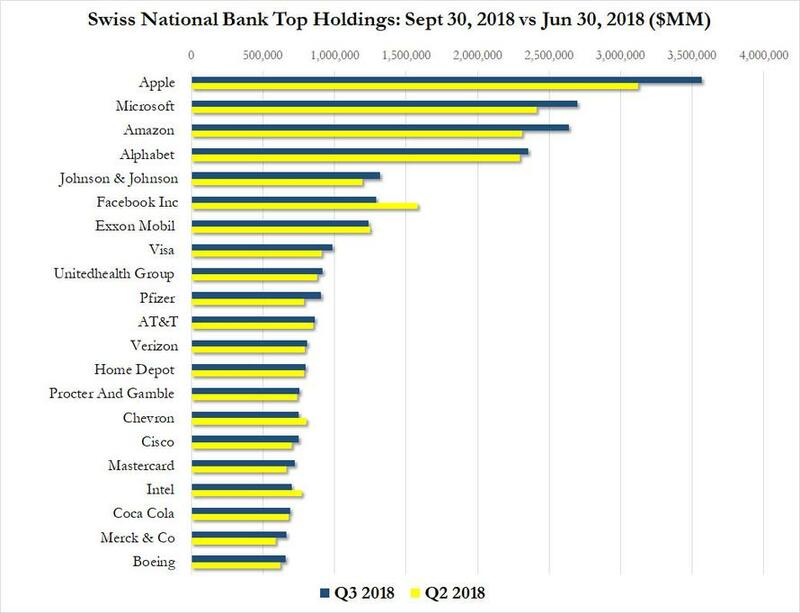 As is well known, equities - Apple, Microsoft, Amazon, Alphabet, and Facebook are 5 of the SNB's top 6 positions - make up 20% of the SNB’s massive holdings of foreign currencies. That was a problem in a quarter when U.S. and European stock benchmarks tumbled, while the franc gained against most of its G-10 peers, leading to a 16 billion-franc loss on that portfolio alone. And, as Bloomberg notes, with a mountain of foreign exchange which at 729 billion francs exceeds the size of Switzerland economy, the central bank is at risk of big swings when markets get turbulent. The good news - for the hedge fund which can just print more money any time it needs it - is that any profit or loss has no bearing on monetary policy, which is determined more by the strength of the franc. The currency’s rally against the euro at the end of last year damped price pressures, with data on Wednesday showing that core inflation rose just 0.3% in December. The franc’s strength left its mark on the SNB’s holdings of foreign currency, which dropped 2.7% in December, the biggest slide since 2012, according to Bloomberg. 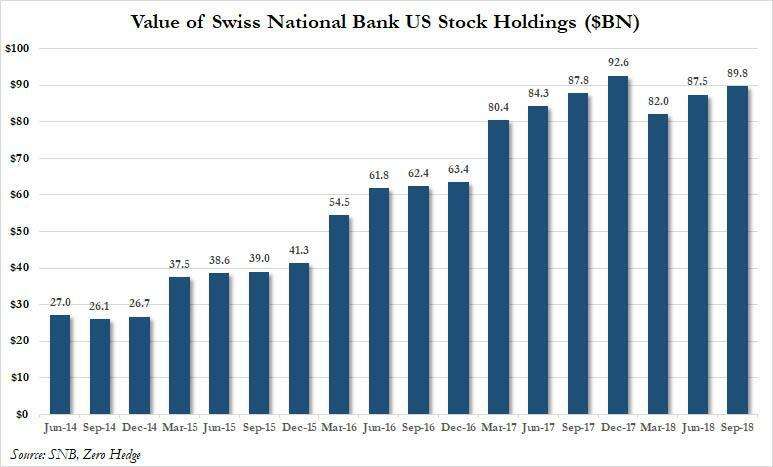 Of course, that the Swiss central bank is the world's largest risk-free hedge fund is only one part of its mystique: unusually among central banks, the SNB not only trades as a public company, but its shareholders receive a dividend (and face no downside when it suffers a loss). As Bloomberg notes, the biggest proportion of shares is held by public institutions, including cantonal governments and cantonal banks. There are also some 2,000 private investors, whose voting rights are very limited. 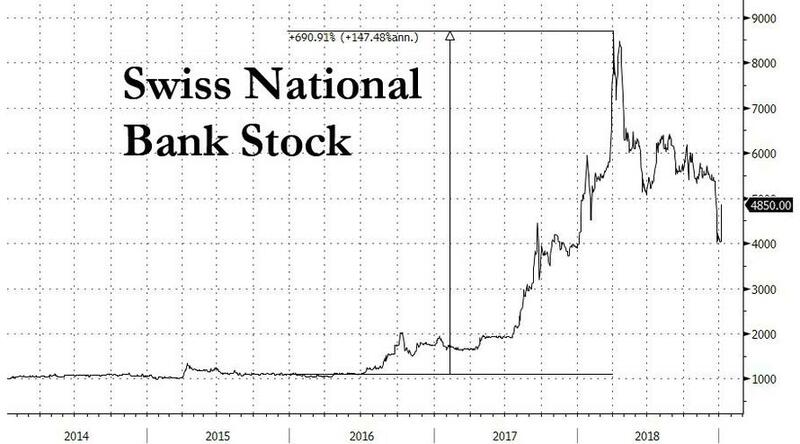 Ironically, in a time when everyone has been obssessing with the rise and fall of bitcoin, few have noted that the stock of the Swiss National Bank rose almost 700% from the start of 2016 through its April 4 all time high of CHF 8600. In addition to its massive equity losses, the SNB also recorded a loss of 300 million francs on on its gold holdings and a net result of 2 billion on its Swiss franc position, which would in Europe's bizarro NIRP world, also includes income from the negative interest it charges on sight deposit accounts as savers pay the central bank for the privilege of, well, saving.